Operations engineering, in its simplest form, is the use of fact-based, quantitative methods to improve operations. Upstream, this is manufacturing planning. Downstream after product launch, this is process improvement. Here’s where the operations engineering tool kit comes out. Theory of Constraints. TOC views a system (production line, patient moving through a hospital, approval process for a loan, etc) as a chain of dependent activities all working towards a goal. The constraint (also called the bottleneck) is the weakest link in the chain…the link that limits the system’s ability to achieve higher performance relative to goal. In business, that goal is usually to make more money now and in the future. TIP: Not all constraints are physical. Don’t overlook your policies! Statistical Process Control. SPC is an operations engineering methodology to monitor process performance over time. Reducing variability is a proven strategy to increase quality, improve delivery, and reduce cost. Control charts measure common cause variation and signal special cause events, necessary for effective problem solving and variability reduction. TIP: Look at data over time for deeper understanding. A table of numbers is a just a photo, a trend chart is a series of photos, a control chart is a movie. 8D Team Oriented Problem Solving. The 8D is a structured, team oriented method to solve problems that reinforces team work and encourages a bias for action. An 8D team and a control chart are a powerful combination that facilitates continuous improvement. Quality Systems. ISO 9000 has spawned a number of industry specific quality standards. These standards outline the requirements for a comprehensive quality system. A good ISO 9000 quality system is more accurately described as an operating system. Not only do external customers benefit but so do internal customers. Waste goes down, costs follow. Discrete Event Simulation. A discrete event simulation provides a dynamic view of the value stream as well the ability to run “what-if” experiments to predict the effectiveness of changes. As such, discrete event simulation is a very powerful tool to maximize investment efficiency and mitigate risk. Think of simulation as a TOC calculator! TIP: Simulation is not replication. The appropriate level of abstraction is critical in the delivery of light, nimble, fast, and reliable models. Operations engineering tools have much more leverage upstream in manufacturing planning than in downstream process improvement. Burnt toast can be scraped but it is better if it is not burned to begin with. In the late 80s, the domestic auto industry was scrambling to respond to significantly better customer quality survey results posted by Japanese competitors. Additionally, the domestics were also struggling to meet the productivity of the transplants. In-system repairs were part of the “invisible factory” as the common practice at the time was to only keep track of defects coming off the end of the line. My idea was to set up “control points” at in-line repair stations. Each repairman was given a tally sheet. 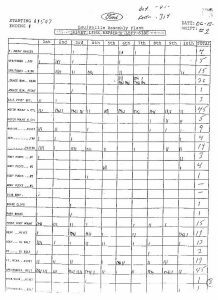 From these tallies, daily control charts and monthly paretos were utilized to track progress and prioritize improvement actions. These documents were prominently displayed on SPC boards at each control point. In-system repairs were reduced by 30% the first year this system was in place. Pre-delivery overtime and off-line inventory were reduced accordingly. TIP: Investigate out-of-control signals right away before the special cause is gone and the trail grows cold. A high-speed printing company was experiencing some growth pains. Overall, the company was very profitable but it was starting to bump into capacity constraints. Multiple printing technologies were utilized. The effects of technology on total cost were murky on an order-to-order basis. Pricing was also a question as the company did not have a good handle on profitability customer-to-customer. My team developed two models: a dynamic operations simulation and a static financial model. The dynamic operations simulation evaluated alternative investment and operating plans to meet future capacity requirements. 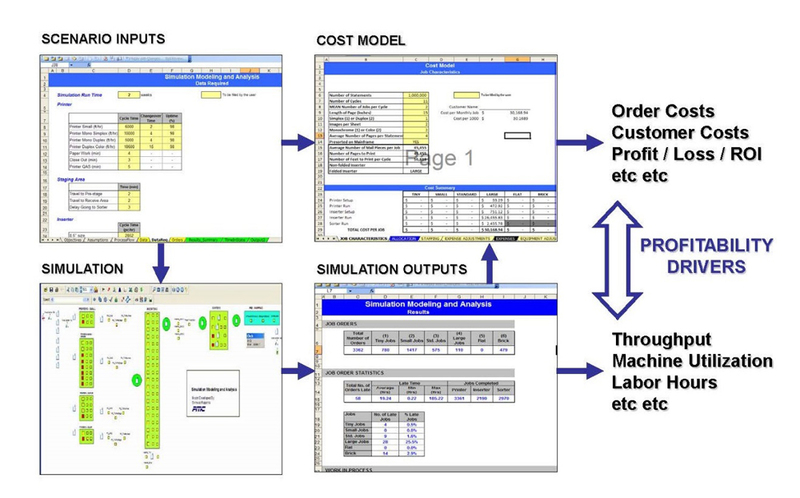 The static financial model allocated costs to orders and customers. Together, these models provided the company’s operations and financial managers valuable insights into the variables that drove their profitability. Both models were transferred to the client to provide a sophisticated “sandbox” to experiment with different investment and operating plans. TIP: It is OK to break your simulation model when running what-if experiments. The more you stress your model, the more robust your solution. A medical device company was planning an off-shore factory to fabricate a new family of coated stents. The stent manufacturing process was characterized by significantly different batch sizes, chemistry constraints on processing times, and regulatory requirements for batch-and-hold in-process inspections. There was a large first-to-market advantage and equipment lead times were very long so the line had to be right the first time. TIP: An ounce of prevention is worth a pound of cure. Integrate simulation into your manufacturing planning process to verify performance before plant construction and product launch. From the company’s manufacturing plan, my team developed a discrete event simulation model of the stent fabrication and coating processes. The baseline model did not reach its production targets…it was a good thing that the company called us before ordering ovens and baths! 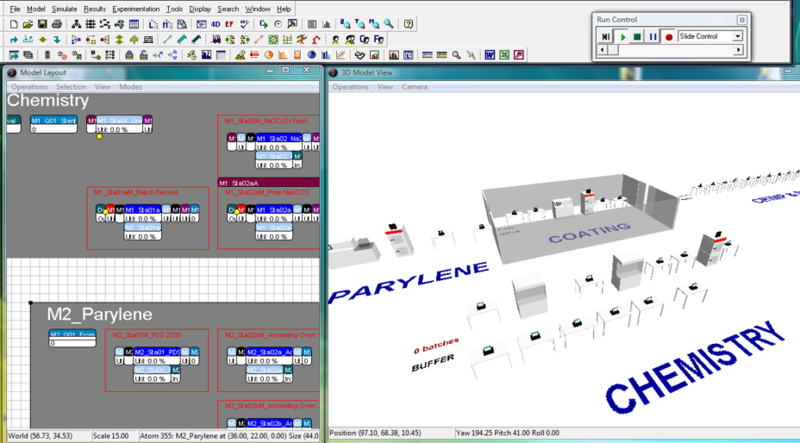 The simulation model allowed us to test many alternative line configurations and operating plans. Batch sizes and shift patterns were optimized to improve flow while meeting all chemical processing and regulatory requirements. These flow improvements drove investment, labor, and inventory all in the right direction: down. TIP: Machines that run big batches are great for minimizing capital investment but not so good for flow and throughput…and total cost.